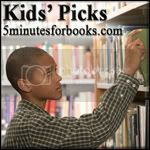 Time for another Kid Picks carnival over at 5 Minutes for Books. What are you and your kids reading? Well, we want to know! At any rate, we picked up some Barefoot Books because 1.) We like Barefoot Books and 2.) We need some good quality reading/singing material that will hold his attention. 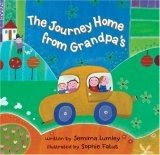 One of my son's favorite musical Barefoot Books is The Journey Home from Grandpa's. (Only in this case we're going to Papa's house but eventually we'll come back home!) Fred Penner leads the way in singing this song about traveling home from Grandpa's on a bouncy, bumpy road with a white helicopter whizzing up and down around and above the car, and past a pink tractor which is bumping across a brown and muddy field. My son loves looking at all of the vehicles and transportation methods presented in this book, except for the crane which is picking up the "icky sticky sand." HA! For some reason, likely the icky stickiness of it all, he is convinced that it's bad. The song and book however are quite good and we highly recommend it. We like looking at (pictures of!) spiders and we LOVE playing drums. This was a good pick on Barefoot's part and we're certainly enjoying it. Bookworm1 would pick Barefoot Books any day of the week when it comes to music and song. They have just really done a marvelous job combining music and story-telling and we highly recommend them. So now enough about us. What about you? What are your children picking to share about this week at the carnival? I can't wait to see! I may be a few days behind in catching up, being that we're traveling, but if you leave a note I'll come visit you upon my return! I need to find some of these books for my girls. They would love them! I hope it's a good trip with your Dad ... I've been meaning to email and tell you I'll be praying! HI Carrie! How's it going? So cute! I must buy some books from there! I'm so sorry to hear about you dad, and I hope your visit is memorable. I pray you have a wonderful visit, Carrie!